Driving down Jared Drive a couple of weeks ago, I saw this light blue house sitting quietly (and probably nearly invisible in summer) amongst the mass of Eastman. There used to be a thriving and notorious community on Long Island. I wonder if this is the last remnant of that neighborhood. My dad was a taxi driver for a while. He never liked having to go to Long Island at night. He did, though, and lived into his seventies with nary a bullet hole visible. This entry was posted in bob lawrence photography, Uncategorized and tagged Eastman (Chemical), Jared Drive, Kingsport TN, Long Island on March 17, 2018 by Bob Lawrence. This grubby little number has been around for a while. Roberts & Johnson Lumber Company, located next to Oakwood on West Sullivan Street, burned in the late 70s. For some reason, nothing was ever done with the plot of land at 451 West Sullivan. Except for now, since the land will be subsumed by the development taking place in that area. Alas, if this were yours and you just had to measure something, you’d be out of luck…it’s rusted closed. This entry was posted in bob lawrence photography, Uncategorized and tagged Kingsport TN, Oakwood, Roberts & Johnson Lumber Company, Sullivan Street on February 6, 2018 by Bob Lawrence. I thank Carl Swann for this item. Its age is indeterminate. 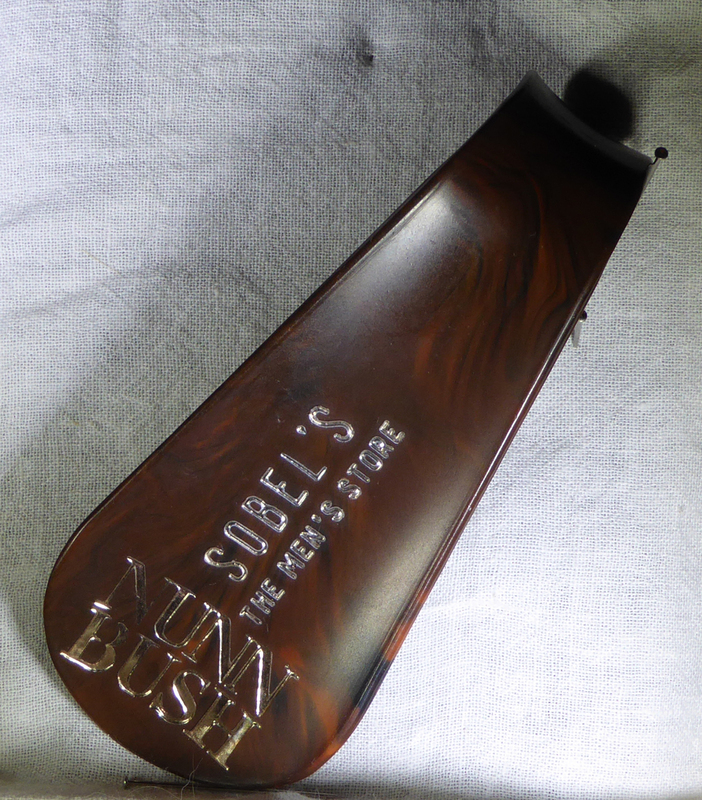 The “Sobel’s The Men’s Store” appears to have been hot stamped onto the shoehorn. “Shoehorn” is an old word, dating back to the late Middle Ages, as a “schoying horne” (it’s all in Wikipedia)…a “horn” in the sense of a tool to help put on a shoe. There were various sizes (long ones for boots); this one is 3.5″ long. Nunn Bush shoes are still distributed by Weyco in Wisconsin…Weyco is essentially a Florsheim operation since 1964. Weyco claims a founding date of 1892. Nunn Bush was established by Henry LIghtfoot Nunn in 1912. I don’t know what happened to Bush. I can’t find a reference. Really, his middle name was “Lightfoot”? Too punny. When I was in the Air Force, we had the opportunity to purchase Florsheim dress shoes. For whatever reason, most all of us had gone back to our Government-issue shoes in six months or so. The Florsheims just didn’t hold up well (this was back in the mid-60s). This entry was posted in bob lawrence photography, Kingsport TN ephemera and tagged Florsheim, Kingsport TN, Nunn Bush Shoes, shoehorn, Sobel's Men's Store, Weyco on December 16, 2017 by Bob Lawrence. 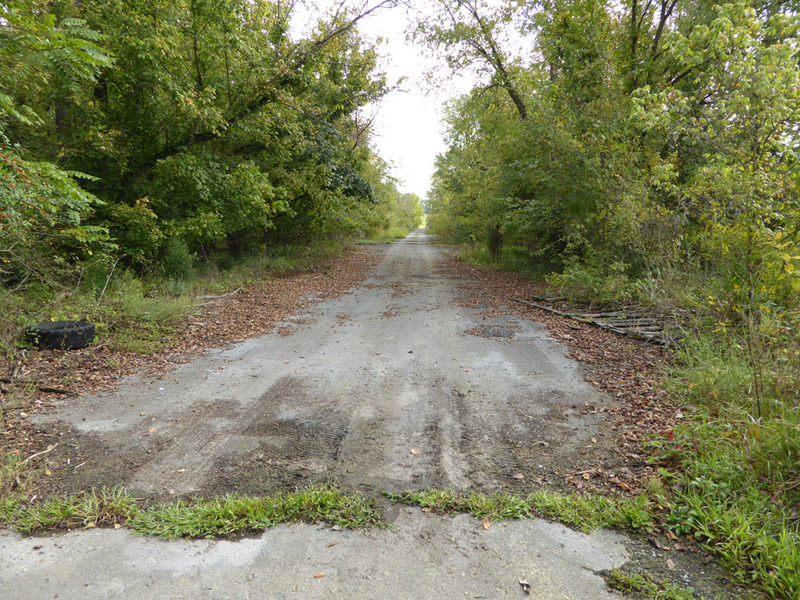 This was part of the Tennessee Valley Dragway (1965 – 1969), looking east to Cleek Road. Had the strip been completed, it would have spanned the 3/4-mile or so between Cleek Road and an area in front of the present Traders Village. Note: the access to this area is gated. It’s on private land. Interesting history…read about it here. This entry was posted in bob lawrence photography and tagged Cleek Road, Kingsport TN, Tennessee Valley Dragway, Traders Village on September 17, 2017 by Bob Lawrence.